Phew, buddy! – Take a load off! 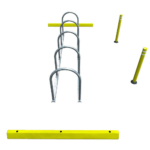 The Biker Bar™ is a leaning rail designed to give bicyclists a place to rest a hand and foot to balance while waiting at an intersection without needing to dismount. People on bikes will no longer have to reach for the curb or a sign post to support them at traffic lights. 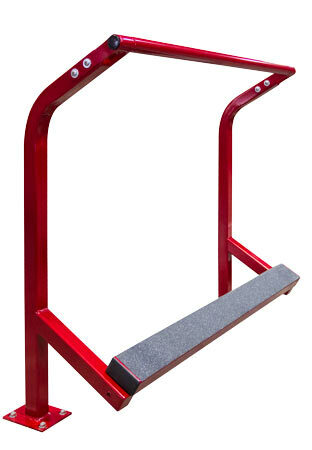 The Biker Bar also acts as a push-off point, with its grip-tape covered foot rest to assist riders in getting an efficient start from a full stop. This helps keep traffic moving efficiently and safely through the intersection. The Biker Bar is modular, so depending on the location, it can be extended to accommodate more bicyclists. 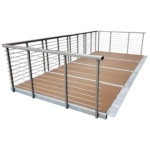 It is easy to install and includes tamper-proof hardware. Each Biker Bar is available with up to one add-on section through our web store. For additional add-on sections, please contact us.